In today's world, customers are moving toward using phones for everything. This, of course, includes online shopping. But the experience in many cases is not great, as most of the sites take seconds to load on the average 3G network connection. You don't want to spend thousands or hundreds of thousands as big players in order to have a nice mobile experience for your customers. But you also know that 53% of users will abandon a site if it takes longer than 3 seconds to load! And once loaded, users expect them to be fast—no janky scrolling or slow-to-respond interfaces. And that is not all, Amazon found that just 100 milliseconds of extra load time cost them 1% in sales. Solution to this, the only AMP + PWA solution for ultimate mobile first Shopify store. AMP stands for Accelerated Mobile Pages and it's a project that provides a straightforward way to create web pages that are compelling, smooth, and load near instantaneously for users. That is right, the AMP pages we generate in Shopify load near instantly. You are probably thinking that the pages are for sure not looking nice and will probably result in a drop of conversion because otherwise you would already make your Shopify store AMP ready. The answer to that question depends on many things, but one thing is for sure. If you are using Ampify Me AMP Shopify solution like thousands of our customers, you can see some awesome improvements in speed, conversion, traffic on your mobile version of Shopify store, white having your pages look nice and appealing. In case you can't wait and want to install the app right now, here is the link for that https://apps.shopify.com/ampify-me. What is PWA (Progressive Web Apps)? PWA stands for Progressive Web Apps, and it helps you deliver an awesome mobile experience to your customers by making your site installable, offline responsive and fast. All this is available to you out of the box with a 2-minute onboarding setup with our PWA application, that is making awesome mobile experiences for hundreds of customers since April 2018. One thing that PWA applications are missing in order to be the best thing ever is the first initial loading, loading is not as fast as AMP instantly loading. Wouldn't it be nice if we could have the best from both worlds? Paul Bakaus wrote a nice blog post explaining differences between the two approaches. Discoverability: AMP is great at getting your pages more visibility. AMP gets the help of a carousel and small lightning next to them in Google search results, while on the other hand progressive web apps aren’t afforded a boost in search engine discoverability. Speed: AMP pages are a much better solution for this for the same reason progressive web apps win the engagement. AMP can only support lightweight content, but that makes for quicker, almost instant load times. No, not anymore. 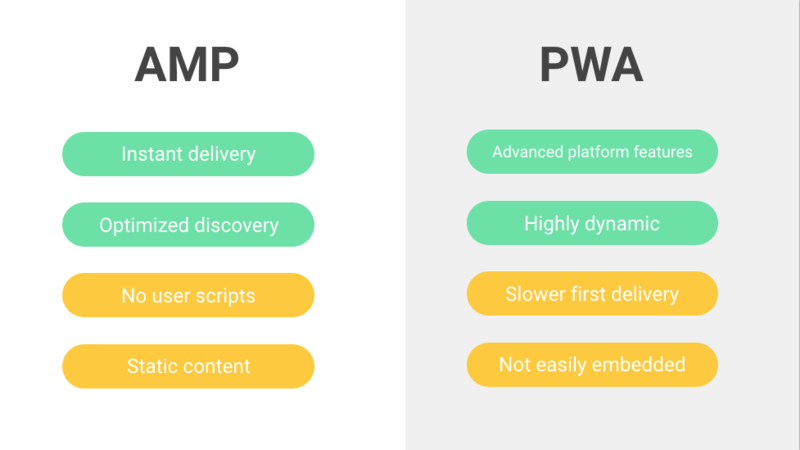 The best solution is to bring the best from both PWA and AMP world by having instantly loading AMP pages that then preload all the needed assets for your PWA app. This way you get the best of both technologies and see the great improvements for your site. Ready to get started with AMP + PWA? Creating a fast, native-app-like experience with the discoverability of the web starts by installing Shopify AMP and PWA solutions.